It was another tiring day. Sanjay Guha, 42, was heading home after a meeting when a nagging pain erupted in his left shoulder and radiated down to his chest. Within seconds, Guha was breathless. “I knew I was in big trouble,” he recalls. But he managed to instruct his driver to head to the nearest hospital. This was a life-sav­­er: an emergency angioplasty and stent insertion minimised the damage caused by the heart attack that struck. Guha represents the new heart patient in India. Unlike developed economies where heart disease is predominantly associated with old age, here in India, cardiovascular diseases (CVDs) have become rampant among the young and middle-aged: data released by the National Heart Institute (NHI) last month shows that over the last five years, there has been a 28 per cent rise in heart patients below 40. “Nearly one-fourth of heart attacks in India occur in men below 40 years,” says Prof Sundeep Mishra, professor of cardiology at AIIMS, Delhi, and editor of the Indian Heart Journal. Earlier believed to afflict only high-income countries, heart disease is now the leading cause of death and disability in low and middle-income regions such as India: about 25 per cent of all deaths in the 25-69 years group are attributable to CVDs, says a 2013 study by the Registrar General of India (RGI) and the Indian Council of Medical Research (ICMR). 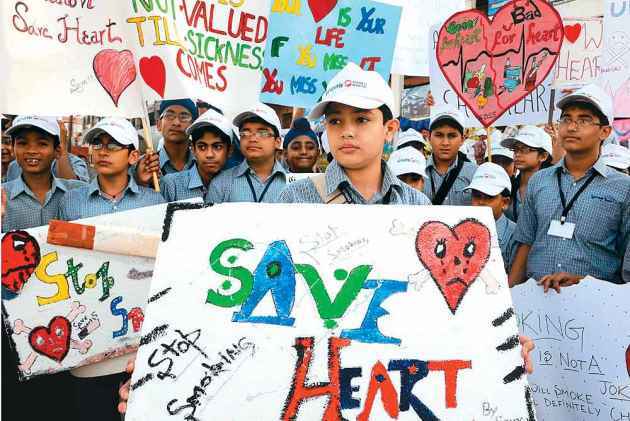 “Undetected heart disease wreaks slow damage in the body, ultimately leading to life-threatening episodes,” says Dr Ashok Seth, chairman, Fortis Escorts Heart Institute, Delhi. Though heart disease is imagined to be a rich, urban man’s disease, the reality is that CVDs also afflict poor and rural communities. “An estimated six crore Indians suffer from heart disease. Some 11 million are from urban areas and the remainder are from rural regions,” says Dr Naresh Trehan, CMD, Medanta--The Medicity. Heart disease is no longer a disease of the old. There’s a 28 per cent rise in heart patients below the age of 40, a five-year study by NHI has found. Women, too, haven’t escaped the tentacles of escalating heart disease. Some 14.3 per cent of females in a Kerala community-based cross-sectional study were diagnosed with coronary artery disease, says a 2016 study published in *BMC Cardiovascular Disorders*. Despite the estimated three-fold rise in incidence of heart disorders among females over the past decade, people are yet to accept the gravity of the risk. “Many women still mistakenly believe that heart disease is a man’s problem, even though it is the No. 1 killer of women,” asserts Dr Roopa Salwan, director, myocardial infarction pogramme and a senior consultant, interventional cardiology, at Max Super Specialty Hospital, Delhi. As in the case of men, CVDs are also striking younger women: a 2016 study by the NHI, covering five years, shows a rise in the number of younger, pre-menopausal women being treated for heart disease. Poor lifestyle choices are to blame for 80 per cent of the cases of coronary artery disease in the world, says the World Health Organisation (WHO). Epidemiologists also point to the link between spurt in CVDs and other lifestyle or non-communicable diseases (NCDs) such as diabetes and hypertension. “Rapid demographic transition and economic liberalisation has bred a new epidemic of non-communicable diseases that account for over 60 per cent of total deaths in India. Cardiovascular diseases hold the largest share,” says Dr Kenneth Thorpe, chairman, Partnership to Fight Chronic Disease (PFCD). Smoking, obesity, high BMI and abdominal obesity, hypertension, high cholesterol, diabetes, high stress levels, genetic predisposition, and an unhealthy lifestyle, contribute to the risk. Though the risk factors for men and women are the same, socio-cultural and gender factors make women extra susceptible. “Self-neglect and an unwillingness to accept a diagnosis of heart disease worsens the prognosis for women,” says Dr Salwan. The increased longevity of the population contributes to the burden of heart disease. Other factors such as the rise in pollutants are related to cardiac emergencies too. “Air pollutants and noxious gases cause damage and constriction of blood vessels, increasing cholesterol deposits and clotting, and raising the risk of heart attacks,” says Dr Seth. Around 20-30 per cent of patients in India are believed to have a family history of heart disease, which means an immediate family member--father, mother, brother or sister--developed a cardiac ailment before the age of 55. This raises their metabolic pre-disposition to heart disease. “Despite a healthy lifestyle and diet, this group may have high cholesterol levels because around 60 per cent of cholesterol is generated by their own bodies,” says Dr Seth. However, no specific gene has been proven to play a major role in predicting risk of heart attacks and researchers say that a healthy lifestyle can triumph pre-disposition any day. Ethnic predisposition to both heart disease and diabetes has, however, been proven by many studies. “Hypertension, truncal obesity, and diabetes/insulin resistance and low levels of good cholesterol are more common in Indians and Asians than other ethnic groups, increasing their risk to CVDs,” say Prof Mishra. Another factor associated with an increased predisposition is the level of inflammation, measured by a marker called the C-reactive protein (CRP). “High CRP levels are linked to coronary artery disease in younger people who otherwise have no clear risk factors,” says Dr Seth. Of all the medications developed for heart disease, statins have had the most dramatic impact, and cut the risk of heart attacks by up to half. Technological advances have also improved medical outcomes for those with heart disease and boosted life expectancy. “Coronary stents have halved the number of patients dying from heart attacks and implantable cardiac defibrillators have raised the chances of surviving a sudden cardiac arrest from five per cent to 98 per cent,” says renowned interventional cardiologist Dr Pravin Chandra. Apart from angioplasties, numerous other complex cardiological interventions—balloon valvuloplasties, carotid and peripheral interventions, aortic stent graft implantations, cardiac resynchronisation therapies, implantable cardiac defibrillators, and heart transplants—are available at leading hospitals across the country. “Innovative technologies have provided doctors the tools to improve the outcomes of cardiac procedures and prolong lives,” says Dr M.S. Hirenath, CSI president-elect and cardiologist at Ruby Hall, Pune. Another positive change reported by cardiac surgeons is the influx of older patients seeking surgical interventions. “A decade ago, older people with heart conditions were resistant to surgeries, but today 30-40 per cent of my patients are in their 70s. The desire for healthy ageing overrides the fear,” says Dr. L.F. Sridhar, senior consultant cardiac aurgeon at Apollo Hospitals, Chennai. But here’s the bad news. Millions of Indians with CVDs lack access to life-saving drugs and procedures. “Only about two per cent of those in need can avail of an angioplasty,” says Prof Mishra. Infrastructural issues, shortage of experts and medical supplies, and lack of funding mechanisms continue to plague the public health system and prevent the realisation of the noble national mission of ‘Health for All’. “An estimated 6 lakh patients in India undergo angioplasties, and more than half need two or more stents. This is just a fraction of those in need. Access to life-saving cardiac devices and medical expertise is essential to make a positive impact,” says Dr Darshan Banker, chief interventional cardiologist and managing director of Bankers Heart Institute, Baroda. Prevention of heart disease is indisputably the only way to stop it in its tracks. Despite the plethora of information available on how to live a heart healthy life, most still have a curative mindset towards cardiac issues. “Let’s remove the fear of dying from heart disease and replace it with the joy of living,” suggests Dr Salwan. While bypass surgery and angioplasty can alleviate blockage, and statins can keep heart attacks at bay, these measures must be combined with healthy living practices to maintain a healthy heart. “It is time for us to take a step towards actualising a generation free of heart diseases through healthy eating, regular exercise and better stress control,” says Dr Trehan. Early detection of CVDs increases the chances of recovery. “Any blockage or complication that is detected early and treated quickly, increases the chances of survival by 99 per cent,” says Dr Trehan, who recommends vigilance for all those above the age of 40. “Middle-aged individuals should get regular medical check-ups for early identification of risk factors such as hypertension, high cholesterol and diabetes, and enable timely treatment,” emphases Dr J.P.S. Sahawney, head of the department of cardiology, at Sir Gangaram Hospital, Delhi. Young people with high risk factors such as family history, hypertension, smoking, or high levels of CRP are also advised to get screened periodically. “The plaques that eventually lead to clogged arteries start accumulating during adolescence, so cholesterol checks should begin as early as age 20,” says Dr Seth. Ultimately, heart health is dependent among emotional wellbeing. Mental health experts recommend maintaining close connections with family and friends, and including stress busting activities in daily life, to reduce risk of heart disease. “Relaxation, meditation, and the use of cognitive therapy must become a way of life for everyone,” says Dr Seema Rekha, a consultant for emotional health at Paras Hospitals, Gurgaon.